According to URA.RU, Yamal reindeer herdingо will face a major decline in the next ten years. This conclusion was made by scientists after geobotanical studies conducted in the Yamalskiy and Tazovskiy districts. Due to the impoverishment of the food base, reindeer will soon have nothing to eat. These dates were announced at a closed meeting by the first deputy governor of Yamal – Alexei Sitnikov. Sitnikov said that Yamal is threatened with the same thing that happened in Alaska in the 1930s. For 10 years because of hunger, the number of reindeer decreased from 600 thousand to 20 thousand animals. Yamal, with 760 ooo grazing reindeer, is now facing a similar problem. Last year’s experiment to increase slaughtering capacities has failed. A detailed study showed that the number of reindeer in each individual family is below the necessary norm and herders simply can not send animals for slaughter. The root of the problem lies in the number of families leading the traditional nomadic way of life. There are more than 3370 such families in Yamal. To solve the problem, no less than two thousand families need to be moved to towns and villages. At the moment this is impossible. Another reindeer herding case which was brought to the Norwegian Supreme Court now concerns reindeer herders in southern Norway of the Femund reindeer district. According to NRK, the dispute is between reindeer herders and farmers who demand a compensation for 530 000 kroner according to the law on damage. The case started in 2012, but the courth did not consider extreme and tough winter conditions for reindeer in 2012. This case becoming a case of principle,which deals with negative attitudes towards reindeer herders in southern Trøndelag and a desire to change the reindeer husbandry law. For more detailed information read on NRK. The app is free and available in Google Play, App Store and some vehicle navigation systems. With the alert online on your smartphone, you will receive real-time alerts of reindeer on the road when you are driving, or you can view live reindeer alerts on the map. The tragedy which left 323 reindeer dead in Hardangervidda occured on Friday night, as reported by NRK. The animals were killed by lightning. – There was a quite hard thunderstorm in the afternoon. The herd was probably struck by lightning, said Knut Nylend from the Norwegian Nature Inspectorate (SNO). After a long struggle in Sakha Republic (Yakutia) a new law on Nomadic Family in Sakha Republic was finally adopted on June 15, 2016. The State Assembly (Il Tumen) of Sakha Republic (Yakutia) for the first time made it protected by law – the definition of nomadic family and nomadic way of life, which will allow indigenous peoples of the North to use their constitutional rights. It took many years to bring the draft law on approval of the Yakutian State Assembly. Acccording to the law, nomadic family is a family that lives and migrates on nomadic territories and reindeer pastures throughout the whole calendar year for the sustainable and rational use of food, water, biological and hunting resources. As reported in Sameradion & SVT Sapmi today: Matti Berg is in tears since the Girjas Sami village (sameby) have won their case against the state. Girjas Sami village has won the case regarding the management of hunting and fishing in the area. The verdict was made today in Gällivare District Court, which is indeed an important principal decision for indigenous peoples. News from Yamal – according to a news report, the extension of the Bovanenkovo railway to the newly constructed seaport at Sabetta has been given official approval. The railway is already the most northerly railway in the world and this will extend it further northwards be several hundred kilometres, bringing the railway to the east coast of the Yamal Peninsula for the first time. The peninsula is the largest single area of reindeer husbandry in the world where primarily Nenets herders undertake long seasonal migrations with their reindeer. This railway will bisect migration routes and result in a sizeable footprint in the construction and operation zone. On November 25, 2015, Legislative Assembly of the Yamal-Nenets Autonomous District approved the Law on participation in the strategic project “Construction and Operation of the New Non-Common Use Railway Line Bovanenkovo-Sabetta”. The railway is to be built and operated under the principles of private-public partnership with the conclusion of an agreement with the District’s Government. The new line will be a continuation of the Obskaya-Bovanenkovo line in compliance with the strategy for social and economic development of Yamal-Nenets Autonomous District through 2020. It is particularly focused on ensuring the construction of railway infrastructure at Sabetta seaport and transportation of cargoes by the Northern Sea Route. Source. You can see imagery of the railway on the Gazprom website. Arctic Ungulate Conference: Abstracts Wanted! (Taken from the Arctic Ungulate Conference (AUC) website). The AUC is an international conference held every four years. The UNESCO world heritage site at Røros in Norway will be the host for the upcoming AUC in August 2015. Circumstances around the death of a 9 month old baby is under investigation. The child in reindeer herders family got sick in the beginning of January 2015. On Monday, December 15th, public hearing on construction of mining plant “Timir”, which will be implemented by EVRAZ Company, was held in Neryungri (Southern Yakutia, Russia). Reflective Reindeer Antlers – It’s that time of year again..
Last year probably the most widely circulated story about reindeer on the internet was the one about the special spray that the Finnish Reindeer Herders’ Cooperative introduced for reindeer antlers for testing. The testing wrapped earlier this year and now, with the winter coming again, new tests are scheduled to begin. These tests will be on about 300 reindeer in 6 cooperatives in the Rovaniemi region in Finland. Reindeer losses to accidents on the roads are considerable. In Finland alone, 3500-4500 reindeer are killed by collisions with cars and trucks each year, with the peak period being the ‘dark time’ between the months of November and January. A new product from the Swedish company Albedo100 will be used which it is hoped will prove to be a more sturdy and sustainable solution than the previous product tested which disappointed in trials. Much higher levels of radioactivity than normal have been found among Norway’s grazing animals, especially its reindeer population, a study revealed on Monday. Almost 30 years after the nuclear plant explosion in Chernobyl, this autumn, more radioactivity has been measured in Norwegian grazing animals than has been noted in many years. In September, 8200 becquerel per kilo of the radioactive substance Caesium-137 was measured in reindeer from Våga reinlag AS, in Jotunheimen, central Norway. In comparison, the highest amount at the same place was 1500 becquerel among the reindeer in September 2012. The ruling is the second time Norrbotten has foiled Jokkmok Iron Mines AB’s ambitions for the site and furthermore recommended that the Mining Inspectorate confirms the decision in order to protect reindeer herding in the area. Sad news came from Norway where few young men witnessed a terrible scene – two dogs were killing a reindeer. The gruesome pictures which were taken outside Tromso by few kayakers this weekend, show two dogs that have chased reindeer into water, attack and killed it. Indigenous peoples of Yamal complain about numerous death of reindeer this winter. The reason of this death loss is not only very severe winter but also poaching. Some reindeer herders are concerned that a planned Statnett powerline from Balsfjord to Hammerfest could interfere with herding in Finnmark. Reindeer might avoid the planned powerline from as far away as five kilometers, reducing the amount of area herders can use, said Anders Eira, a reindeer herder and a senior adviser in the Sami group Protect Sápmi, to the BarentsObserver. A 150-kilometer segment of the project is expected to be completed by 2018 but there is no definite timetable for the remaining 350 kilometers. Eira said the powerline will go through 30 herding districts and could affect as many as 300 herders. He said he is particularly concerned about reindeer seeing ultraviolet light from the powerline. According to a 2011 study in the Journal of Experimental Biology, in order to adapt to the extreme seasonal light changes of the Arctic region, a reindeer’s eyes do not block out all ultraviolet rays. (see Statnet’s information page about this project here. The draft law “On Nomadic Family” was adopted in the first reading on April 14, 2010. Now, four years have passed. In June this year, the Standing Committee on Arctic Indigenous Peoples of the State Assembly (Il Tumen) of Sakha Republic (Yakutia) will introduce a revised draft for the second reading. The Working Group of this project included scientists, representatives of public indigenous organizations, ministries and departments. Oil workers are trying unsuccessfully to extend a road to an oil field through a sacred lichen grove and Khanty ancestral lands 180 km from Nizhnevartovsk. At the conference “Days of Beringia” that was held the last time in 2013, the participants concerned the fact that today there is less connection between Chukotka and Alaska, contacts between related indigenous peoples of the two countries have weakened. It was stressed that even in the difficult 90’s connection were much closer, that cultural exchange was carried out regularly enough. And one of the decisions of the conference was to have conferences through TV and radio service (since today there is no means for regular trips overseas). It was scheduled to have twelve of suchlike conferences in 2014. UV vision help reindeers find plants in snow cover, but in the depths of winter their wide irises and sensitive eyes means the power lines appear particularly bright. Power lines are seen as glowing and flashing bands across the sky by many animals, research has revealed. The work suggests that the pylons and wires that stretch across many landscapes are having a worldwide impact on wildlife. Scientists knew many creatures avoid power lines but the reason why was mysterious as they are not impassable physical barriers. Now, a new understanding of just how many species can see the ultraviolet light – which is invisible to humans – has revealed the major visual impact of the power lines. According to local administration, young indigenous people in the North of Russia – Kamchatka, participated in a meeting devoted to occupational guidance. The meeting was conducted by Valentina Bronevich, vice-chairman of the Government of Kamchatka region. The main issue to discuss was to promote youth employment in reindeer husbandry of the region. The meeting gathered around 30 participants, among them were residents from Khailino village, Apuka village, Ossora village and Srednie Pakhachi village. All the participants expressed their interest and concern about salary of reindeer herders, issues of education and employment into reindeer husbandry, and measures of state and local administration support for those who choose this profession for themselves. Natalia Nitsenko, the head of Employment and Migration Policy Department of Kamchatskiy region, Vladimir Kleymenov, head of “PO Kamchatolenprom” enterprise, and representatives of regional ministries and departments of Kamchatskiy region were answering to the questions addressed by young people. (Source: Globe and Mail, Canada) Tracts of land that had been set aside for reindeer grazing in Canada’s North have instead been offered up by the Conservative government for oil and gas exploration, newly released documents show. Companies interested in obtaining petroleum exploration rights in the Mackenzie Delta and Beaufort Sea region of the Northwest Territories were asked last year to nominate blocks of land that they wanted to see included in a subsequent call for bids. Reindeer-grazing reserves near the communities of Inuvik and Tuktoyaktuk were among the lands that were included in that call for nominations, pending a necessary amendment to an order-in-council imposed in 2010. Documents show officials at Aboriginal Affairs and Northern Development Canada have discussed just such an amendment in order to allow the reindeer-grazing land to be included in the bidding for exploration licences. “Most Crown lands in the Mackenzie Delta are withdrawn from disposal under an order-in-council to allow for a reindeer-grazing reserve,” says a briefing note to a top department official from last August. According to BarentsObserver, the new plant will be based on the resources of the Salmanovskoye and Geofizicheskoye fields, both located on the eastern bank of the Ob Bay in the peninsula of Gydan. The total resources of the fields amount to about 380 billion cubic meters, the company informs. The federal government has approved the plans and project development is due to start in 2018, Itar-Tass reports. Thursday was Sami National Day, celebrated internationally by indigenous people of the European Arctic, including in Sweden. It was also the time when the annual Jokkmokk Winter Market, with a history over 400 years old, started in the far north of Sweden, just above the Arctic Circle. But the market is not without its controversies, and several artists are boycotting this year due to disputes over the possible establishment of a mine in Kallak, located in the municipality of Jokkmokk. A handful of artists, designers and culture workers who were originally planning to participate in the Jokkmokk Market have announced their decision to boycott. First Deputy Director of the Department for the indigenous peoples of the Yamal-Nenets Autonomous Okrug Eduard Yaungad commented difficult situation in Yamal and Priuralsky districts. He explained that kind of situation occurres periodically on the Yamal Peninsula, for example, similar situation was observed fifteen years ago and it was in general connected with weather conditions. On Saturday morning, (09h00 CET / Swedish time) the national Swedish radio station (Sveriges Radio AB) will run a program sent from the reindeer corral in Tjåmodis, Jåhkågasska. The program will be about the mining project proposed for Gallok (Kallok), reindeer herding and Swedish Sami policies in general. Guests include Helena Omma, Rebecca Lawrence, Niklas Spiik and Stefan Andersson. Follow the link from this page on SR here. The Icelandic design company Gagarin recently completed a 600 m2 design of the wild reindeer exhibition in the Hardangervidda National Park centre in Norway. The Hardangervidda park is Norway’s largest national park and it holds the largest wild reindeer population in Europe. The exhibition is comprised of 13 interactive installations which cover almost everything one can learn about wild reindeer. Users get to explore and experience, via tangible and unique solutions, the various historical, biological and social aspects related to the existence of the reindeer and learn about the various threats that are being imposed on their habitat – mostly by people. The result is striking. Images from the exhibition here. Helena Omma was a keynote speaker to the Arctic Futures symposium that was held in Brussels yesterday (October 16, 2013). The entire day was broadcast live on the web and we have captured her presentation and can share it with you here. Her presentation was entitled ‘Reconciling land use conflicts with reindeer herding communities with economic development in the Arctic’. Besides introducing the audience to the world of reindeer herding, she discussed the ongoing situation facing herders in northern Sweden where extensive mining activities are planned on reindeer pastures and she also touched on the EALLIN project. You can watch the video (17 minutes, in English) below. Norway’s Conservative leader Erna Solberg said she would form a minority cabinet with the populist Progress Party after talks with two centrist parties broke down on Monday, giving ground on oil exploration and immigration. Solberg agreed to give up plans to drill for oil in several promising Arctic areas and also agreed to tighten asylum policies to win the support of her eventual coalition partner and the outside backing of the centrist Liberals and Christian Democrats. She now faces a difficult alliance with the right wing, anti-immigration Progress Party, which will enter government for the first time. Since it was founded in 1973, and until now, mainstream parties had considered it too radical for power. “We can’t hide the fact that we are very pleased with the immigration issues here. We have got a fairly strong tightening,” said Progress leader Siv Jensen, who is likely to become finance minister when the government takes office Oct 18. The new coalition have signalled an intention to change their policies in northern Norway, which may impact reindeer husbandry, relations with the Sami parliament and the mining industry. Conservatives Win in Norway – What Will It Mean for Reindeer Herders? Very interesting post on Eye onthe Arctic and also posted on the Foreign Policy Blogs by Mia Bennet. She takes a look at what the victory of the Conservative Party might mean for northern Norway. The Conservatives, however, did not win enough seats to form a majority government. Headed by new Prime Minister Erna Solberg, they will likely ally with the populist, anti-immigrant Progress Party, which won 29 seats. The Conservatives will probably also have to work with the two small, centrist parties, the Christian Democrats and the Liberals. VG has excellent infographics illustrating the election results. Bennet also looks specifically at what the Conservative victory might mean for reindeer herders. Stephan Dudeck is an anthropologist based at the Arctic Centre in Rovaniemi, Finland. His current research is part of the Orhelia projet – Oral History of Empires by Elders in the Arctic. He writes a blog that covers lots of aspects of his work – a recent posting is a report from his visit to the reindeer herders of the 7th brigade of the Kanin reindeer herding cooperative, in the Nenets Autonomous Okrug. At the time of his visit the camp was situated some 16 km from the village of Karepole near the river Laka one of the tributaries of the river Kuloi. Interesting photos and insights. Read the full posting here. Also here is an earlier posting covers his visit to the tundra during the summer of last year. Northern Norway is bracing itself for the energy and mineral rush that is affecting the entire Arctic. Development plans, mining projects, LNG plants, offshore oil drilling plans are all swirling around the region as the rush for Arctic resources progresses. A fascinating website has been launched by Trine Hamran, a journalist, documentarist and social anthropologist who has a passion for the region. Border Stories is a venue for very different northerners to relate their stories in first person to give context to what this rush for development means for people on the ground. One of those featured is Mariann Wollmann Magga, a reindeer herder and member of the Sami Parliament who lives near Kirkenes, one of the development hotspots of this newly envisioned resource region. The calving grounds of her families reindeer is an area that has been mooted as a possible site for an LNG plant. In Finland, the production year for reindeer herders is calculated from June 1st. According to a forecast by MTT Agrifood Research Finland, final figures for reindeer husbandry for the current year will show average income in the sector slashed by more than half. The average income for a reindeer herding enterprise in the 2012 – 2013 production year is expected to be a mere 2,870 euros, down from the 6 500 euros seen in 2011 – 2012, which in turn had declined by 20% from the previous year. Calculations show that a family operating a reindeer production operation can expect to see an average hourly income of 4.30 euros for the some 1,300 hours of work invested in the business, and no more than a 1.5% return on an average capital investment of 59,000 euros. Reindeer husbandry is more profitable in the far north, in areas occupied by the indigenous Sami people. countries share responsibility for protecting this region, in particular by limiting their greenhouse gas emissions. The rapid pace of development on the Yamal peninsula nd its impacts on Nenets reindeer herders is covered in this report with maps of the projected disutbance of pastures, alongside a photo by EALAT PhD student Anna Degteva. Wild reindeer may face a new threat from the extreme sport of snow-kiting, a study has found. Scientists modelled reindeer’s fright responses to both snow-kiting and skiing in an alpine area of south Norway. They found that reindeer were more afraid of snow-kiters because of the airborne kite. The study recommends that controls are put on the sport to prevent harm to wild reindeer. 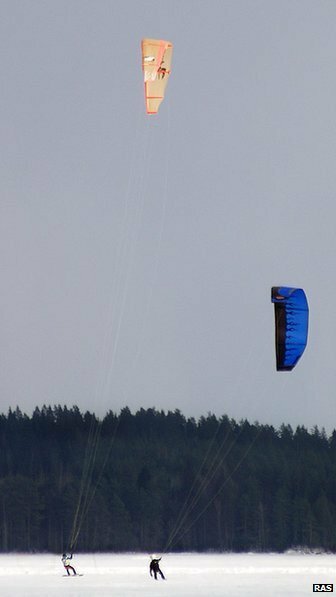 Snow-kiting is a new sport, similar to kite-surfing, in which the rider wears skis and is pulled along by a kite. It is thought to be one of the fastest-growing recreational sports in Norway. Amid growing concern among wildlife managers and politicians the study, which is published in the journal of Applied Animal Behaviour Science, assessed the potential effect of this activity on wild reindeer in the alpine area of Norefjell-Reinsjøfjell. Scientists conducted experiments in which the reindeer were confronted by an approaching skier or snow-kiter. They gathered data on the animals’ reactions, such as distance from the skier or snow-kiter when the reindeer fled, how far they ran and how long the fright response lasted. Using this information, the scientists were able to predict the likely effects of an increasing number of skiers and snow-kiters on the reindeer population. This article by Kaisa Raitio and Rebecca Lawrence was originally printed in IWGIA 04/06 and is reprinted with the authors permission. The official status of the Sámi as the indigenous peoples of Finland has been recognised in Finnish legislation since the early 1990s. The right of the Sámi to practice their culture is enshrined in the Finnish constitution (1999), and in this context Sámi culture has been understood to include traditional Sámi livelihoods, such as reindeer herding, hunting and fishing. In addition to the constitution, the Reindeer Husbandry Act (1990/848) and the Act on Metsähallitus (Finnish Forestry and Parks Service, 1378/2004) give reindeer herding – and Sámi reindeer herding in particular – relatively robust protection. Finland has also ratified Article 27 of the International Covenant on Civil and Political Rights, which requires recognition of the cultural rights of ethnic minorities. Applied in Finland, this requires the Finnish state to protect and give recognition to the rights of the Sámi to practice traditional indigenous land uses, such as reindeer herding. In concrete terms, the national and international regulations require that reindeer have free access to grazing lands irrespective of land ownership, and that other uses of state-owned land should not be practiced in a way that significantly hinders” reindeer herding (Reindeer Husbandry Act (1990/848). The Finnish government has been criticised, however, both by Sámi organisations – for not ensuring adequate practical protection of reindeer herding – and by the UN Committee on the Elimination of Racial Discrimination – for failing to pass legislation on the more fundamental question of Sámi customary title to land. The Finnish government has failed to pass legislation on Sámi land ownership issues three times (1952, 1973 and 1990) and the forestry industry has been a powerful lobbyist in opposing any legislation that might give recognition to Sámi claims to land (Tuulentie 2003). In this climate, continuous and heated debates persist over how the rights of the Sámi can be balanced against other resource management interests within the traditional territories of the Sámi, of which 90% is currently claimed by the Finnish state as crown lands. One of the most controversial debates of recent times has focused on the conflicting interests of reindeer herders and the logging industry. This artaicle aims to briefly outline some of the local, national and global links and challenges in a dispute over logging in the municipality of Inari, in Northern Lapland, where the protests by Sámi reindeer herders and environmental NGOs over state logging on reindeer winter grazing areas have received considerable international attention.